I’m realising more and more that (Open Access) predatory will be more and more problematic in the scientific world. A short while back I wrote about this, and promoted the work of Jeffrey Beall’s list. Since that post I’ve received several more requests from journals. With this post I want to demonstrate what I look at/for when judging an e-mail I receive. Let’s unpick the e-mail. First of all, although I’d like to think my work is brilliant, the simple fact you get several requests to publish something should be a first warning sign. Sure, sometimes you might get genuine requests, and the further you progress in your academic career this is likely to increase. But most of the time it is YOU who responds to calls, and it is YOU who has work you want in a journal. The from-email address does not look very professional for a publisher. The mail was sent to my gmail account. It is not really clear why they didn’t use my institutional address. The title of this particular journal ‘American Journal of Educational Research’. 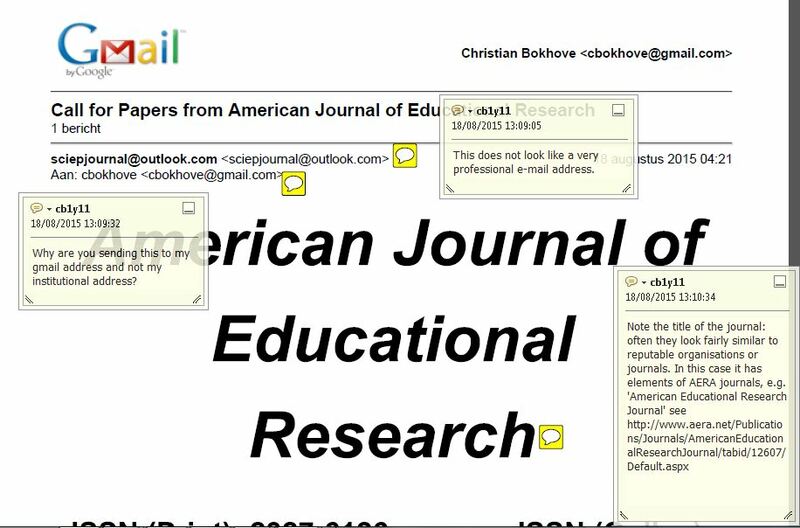 Often dubious journals use anagrams of reputable journals, for example this name resembles the ‘American Educational Research Journal’ from AERA. Often same fonts are used or journal websites look very slick and professional. I think they hope you will think it then must be a good journal. I then took the journal title to Beall’s list and did two things. First I entered the title in the search box with ” so it would look for the whole term. This gave two hits. One post is from end 2012 and clearly is about the publisher in question (SCIEP), another strangely enough also gives the same . It is very interesting to read the whole post and to also read the comments. Also using the name of the publisher in the search box, “Science and Education Publishing”, yields some interesting results, including a murdered doctor as editor in chief. This is another trick predatory journals often use: they will sometimes use names of people who probably don’t even know their names are being used (and if they do, they should probably pull back as quickly as possible from these fraudulent affairs). Sometimes even content is just plagiarised from other journals. The mail continues, the salutation seems to indicate that there might have been some form of automation in this e-mail. The mail mentions an Impact Factor to ‘wow’ the reader. I think it is very very very unlikely this journal has an Impact Factor. They are often used to, again, instill a feeling of ‘wow this is a good journal’ with the reader. The mail then mentions they were very interested in a paper I wrote for the ICME-12, but unfortunately that conference was not in 2015 but 2012. Factual errors like those do not convey a positive image. This also certainly holds for the gmail addresses. The mail concludes with a section on what might be the whole reason for the e-mail: money. 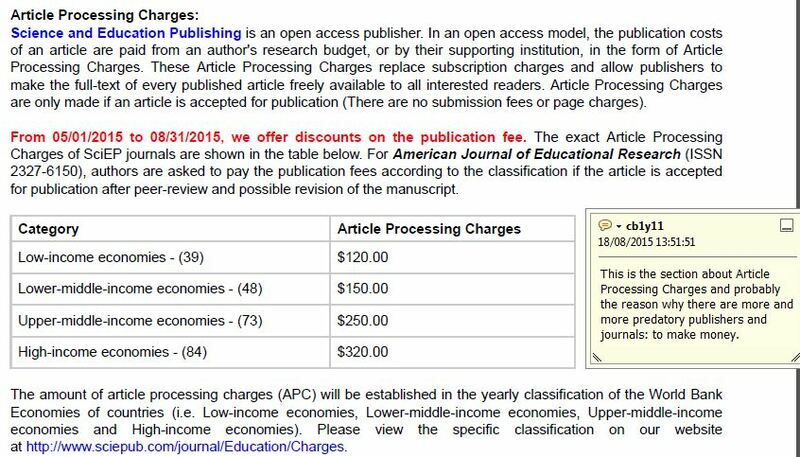 With the, in principle positive, advent of Open Access with their ‘Article Processing Charges’ (APC) rather than university subscriptions, individuals are asked to pay APCs. With relatively low APCs predatory journals hope you will take the bait After all, it seems positive: a modest cost, a publication, etc. But these predatory journals are problematic. First and foremost they damage the reputation of (social) science. Peer review is often promised but almost non-existent. Of course it is nice to think you are a genius writer and Academic but in most cases *everyone* can improve their work. It does not make sense if an article is accepted within days with no changes requested. Paying to be published is a form of ‘vanity press’. Is peer review perfect? Certainly not, I’ve had my fair share of reviews I thought were pretty dubious (both reject and accept) but I think the alternative, namely *not* to have peer review, would be even more disastrous. 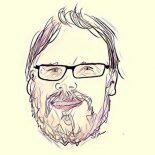 Within the realm of ‘peer review’ we should experiment with variations like post-published-reviews and maybe value other modi (note: I for example have always been quite irritated by the fact that social science does not value peer reviewed conference papers as highly as in Computer Science). But in the core, peer review works, just as long as you are critical about where you publish. I do see an additional tension between the big publishers and efforts to make ‘big business’ less influential on Academia. I know several small, non-big-publisher journals that are of top quality, but within the current dynamic of OA journals it is becoming increasingly more difficult to recognise them. So if you are in doubt, also ask around. Let’s make sure we stay vigilant. This entry was posted on August 28, 2015 by cbokhove in Education Research and tagged predatory journals.